Douglas Photo Calculator iPhone App Review: Say Cheese! Douglas Photo Calculator is an iPhone app developed by Douglas Software. 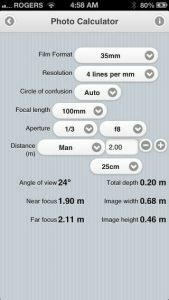 This helpful app allows photographers to make the calculations that will take the guesswork out of taking great photographs. The thing about great photography, truly great photography, is just how much effort it takes to create the most simple of pictures. Some professional photographers spend hours, if not months, making the calculations that will help them achieve long exposure shots or other tricky images. These calculations are a pain. Moreover, there are moments when you just don’t have the time to make these calculations and set up the shot. That’s where this app comes in extremely handy. 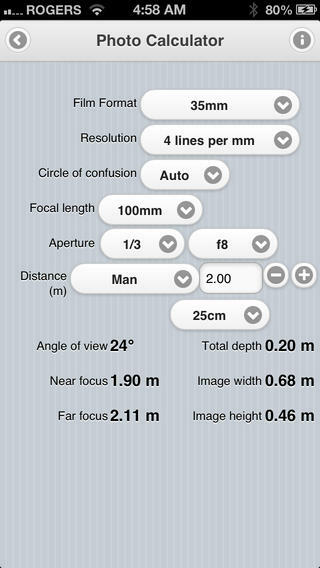 Douglas Photo Calculator calculates depth of field, hyperfocal distance, angle of view, image area and diffraction. The app supports calculations for all kinds of different film (beyond just 35mm), and there are multiple language and measurement unit options to choose from as well. The interface is a bit bare bones, to be honest. That doesn’t really put me off, however. This app is a calculator tool, and the plain interface just makes sense here. The drop down menus make it easy to set your parameters, such as resolution, aperture, and focal length. Don’t be put off by the high price tag attached to this app. Douglas Photo Calculator is, by far, the best tool I’ve found for making photography-related calculations. Whether you came up as a photographer in the pre-digital age, or want to double check your digital camera’s settings, this calculator app is important to help you take better pics. If you believe photography should be more precise than mere “point and shoot” experiences, this handy app will help you to take your photography skills to the next level. 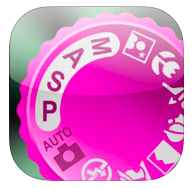 If you are a photographer, then you need to own this app. Douglas Photo Calculatorrequires iOS 5.0 or later. Compatible with iPhone, iPad, and iPod touch. This app is optimized for iPhone 5.